Correspondence to: Dr P J Cowen Research Unit, Littlemore Hospital, Oxford OX4 4XN. Recent neuroendocrine studies suggest that patients with chronic fatigue syndrome may have increased brain serotonin activity.1 2 This could be relevant to the pathophysiology of chronic fatigue syndrome because serotonin pathways have a role in mediating central fatigue.3 Currently, however, the existence of abnormal serotonin neuroendocrine function in patients with chronic fatigue syndrome is controversial because of contradictory findings from samples of heterogeneous patients4 5 and the use of serotonin probes such as buspirone, which are of doubtful pharmacological specificity.1 We aimed to measure the increase in plasma prolactin after administration of the selective serotonin releasing agent d-fenfluramine in men rigorously diagnosed as having the chronic fatigue syndrome and carefully matched healthy controls. Ten men (mean age 39.0 (SD 9.9) years; mean weight 84.9 (12.6) kg) were recruited from general practitioners' consecutive referrals to a hospital infectious diseases clinic. All met criteria for the chronic fatigue syndrome and the more restrictive ICD-10 (international classification of diseases, 10th revision) diagnosis of neurasthenia (which excludes patients with depressive and anxiety disorders).3 None had taken psychotropic medication for at least four weeks. Male controls, volunteers without psychiatric disorder, were matched with patients for age (39.9 (7.6) years) and weight (83.0 (13.0) kg). Subjects gave informed consent to the study, which was approved by the local ethics committee. Subjects came to the laboratory fasted at 9 am, when we inserted an indwelling venous cannula. After two baseline samples had been removed over 30 minutes, subjects received D-fenfluramine (30 mg orally). Further blood samples were taken over the next four hours for estimation of plasma prolactin, D-fenfluramine, and D-norfenfluramine. Prolactin was measured by a standard immunoradiometric assay, and drug concentrations were assayed by gas-liquid chromatography. Changes in plasma prolactin were analysed by a two way repeated measures analysis of covariance with diagnosis and time as the main factors. Plasma concentrations of D-fenfluramine and D-norfenfluramine were entered as time dependent covariates. The analysis of covariance showed a significant main effect of time (F=8.86; P<0.001) and a significant interaction between diagnosis and time (F=3.24; P=0.01). Post hoc testing with Fisher's test of least significant difference showed that plasma prolactin concentrations in patients with chronic fatigue syndrome were significantly higher than in controls three and four hours after D-fenfluramine was given (fig 1). The mean area under the curve of prolactin secretion after D-fenfluramine (with subtraction of baseline secretion) was 51.7 mIUxml/h in chronic fatigue syndrome patients and -64.2 miUxml/h in controls (95% confidence interval of mean difference, 5.0 to 227, t=2.20, df=18, P=0.041). Mean area under the curve did not differ in patients and controls for plasma D-fenfluramine (39.9 v 49.4 ngxml/h; -31 to 12, t=0.93, df=18, P=0.37) or D-norfenfluramine (10.4 v 16.8 ngxml/h; -14 to 3, t=1.44, df=18, P=0.17). D-fenfluramine and D-norfenfluramine concentrations were not significantly correlated with prolactin secretion in either patients or controls or in both groups combined (P>0.25 for all areas under the curve, Pearson's product moment coefficient). 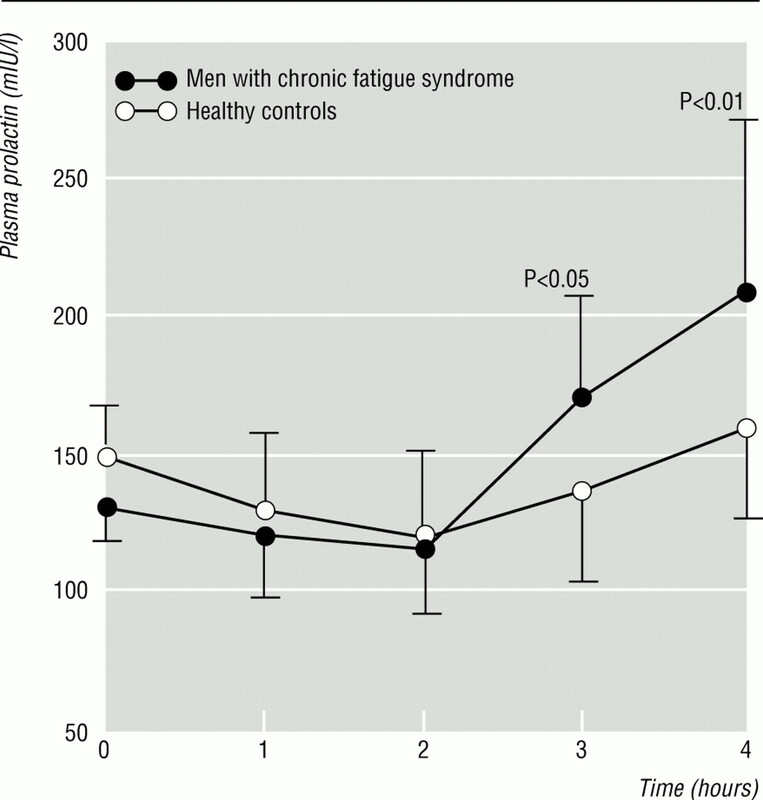 Our data show a significant rise in prolactin responses to D-fenfluramine in men with narrowly defined chronic fatigue syndrome in comparison to healthy controls. This finding supports some,1 2 but not all, previous neuroendocrine studies,4 5 and suggests that the chronic fatigue syndrome is associated with increased brain serotonin function. Though depressive symptoms are common in chronic fatigue syndrome, patients with major depression have unchanged or lowered prolactin responses to D-fenfluramine,2 making it unlikely that chronic fatigue syndrome and depression share a common pathophysiology. Raised brain serotonin activity might explain the excessive fatigue experienced by patients with the chronic fatigue syndrome.3 Increased prolactin release mediated by serotonin in the chronic fatigue syndrome might, however, be a secondary consequence of behavioural changes such as prolonged inactivity or disturbance of the sleep-wake cycle.
. Possible upregulation of hypothalamic 5-HT receptors in patients with post-viral fatigue syndrome. BMJ 1992;304:1010–2.
. Contrasting neuroendocrine responses in depression and chronic fatigue syndrome. J Affect Disord 1995;35:283–9.
. Chronic fatigue. Psychiatr Clin North Am 1996;19:549–72.
. Neuroendocrine responses to D-fenfluramine and insulin induced hypoglycaemia in chronic fatigue syndrome. Biol Psychiatry 1995;37: 245–52.
. Neuroendocrine assessment of serotonin (5-HT) function in chronic fatigue syndrome. Can J Psychiatry 1995;40:3–6.